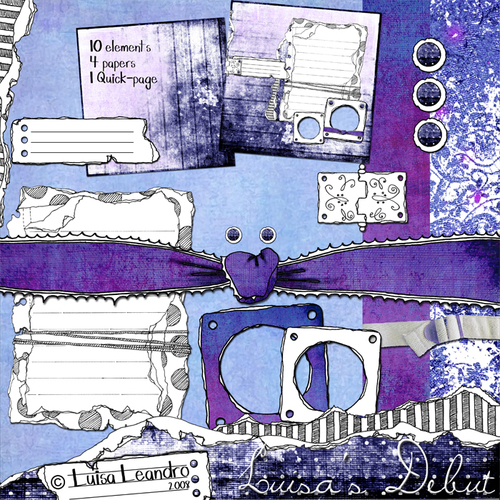 This alpha set is kind of magical looking and would look fantastic on any themed page ... or print out onto photo paper, or card and cut out to use on a hybrid project. Grab yourself a bargain in the mad Monday sale at Sophia's. 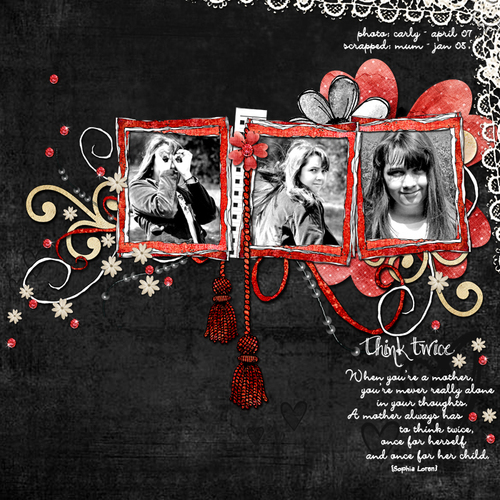 Another new kit available only at the Sophia Sarducci store - 'In Stitches'. 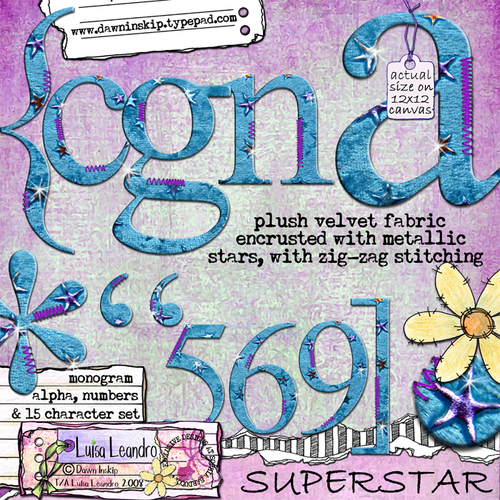 This unique kit contains 28 character and personality words - machine stitched onto fabric and shaped with pinking shears and they make the perfect embellishments for any layout. 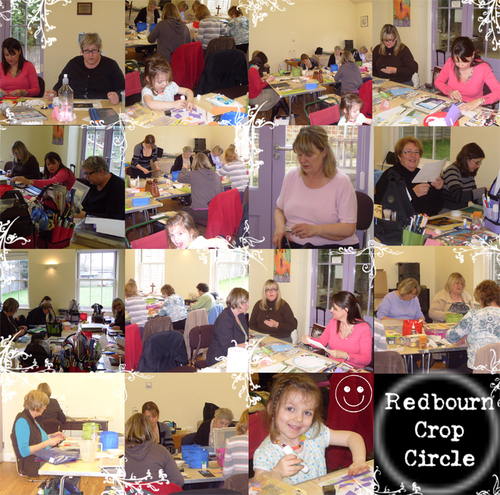 Had a really fantastic weekend - much needed and in the company of friends... Saturday I spent the whole day at a crop - Diane and Lynda have a wonderful set up - I was a little nervous going, but so glad I did - It felt good to meet friends I already knew and make some new ones too. 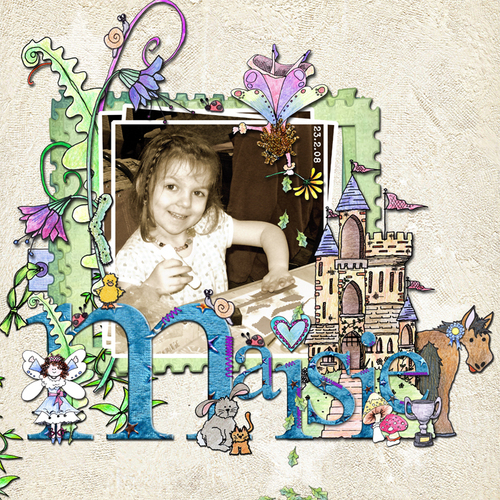 The atmosphere was the best and I want to thank Diane, Lynda and ALL the girls for making me feel so welcome (thanks to Janine for allowing me to post pics of Maisie). A little catch-up on Steve - he gets bigger by the day. Loves to be near us - and a favourite spot to snuggle up is inside Carly's sleeve and under her armpit - definitely a male! 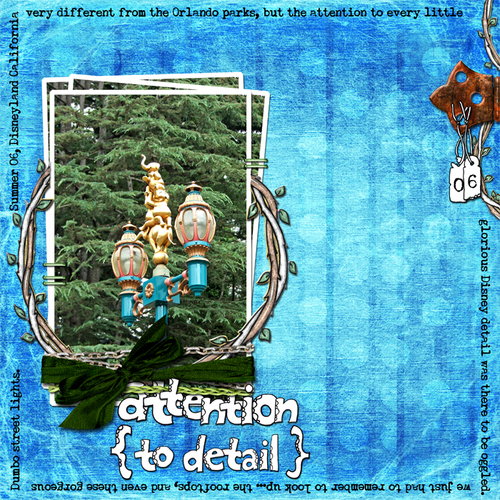 Page created using kits: 'Pets', 'Spellbound', Love You Loads', 'Land of Make Believe', 'Hearts and Flowers' and 'Tiny Tags'. 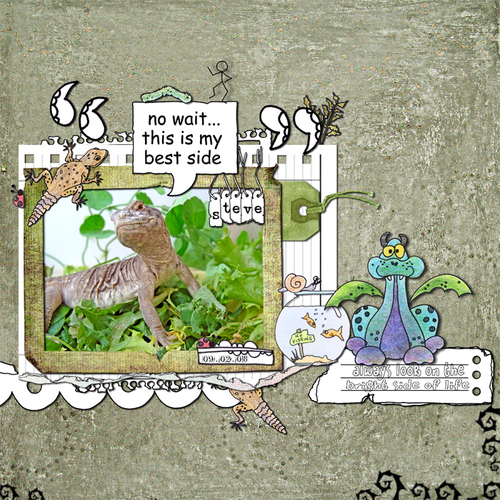 Steve 'in' his dinner - striking a pose :) Layout created using kits: 'Cartoon Capers', 'Pets', and 'Luisas Debut. Squiggly brushes are nu Inobscuro. 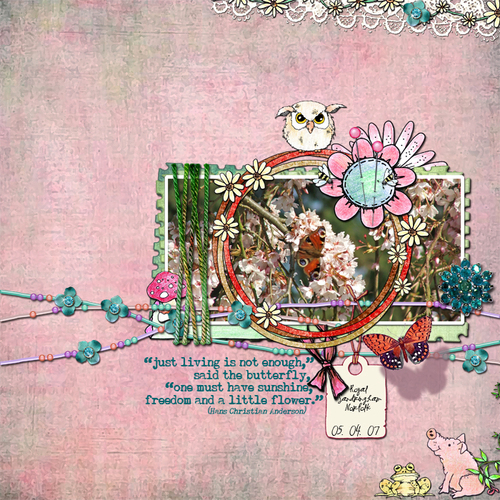 I had this urge to use pink (a rarity for me) - and then remembered the photo's we snapped at Sandringham last year. We'd chosen the wrong day to look around the house, but the weather and grounds were glorious - butterflies and wildlife everywhere. 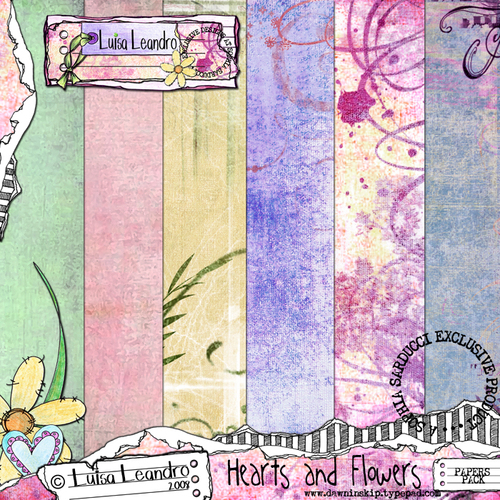 Layout created using my kits: 'Pets', 'Land of Make Believe', 'Spellbound', 'Hearts and Flowers', 'Chocolate Sensation', 'New Beginnings', 'Art Explosion' and 'Baby Love'. 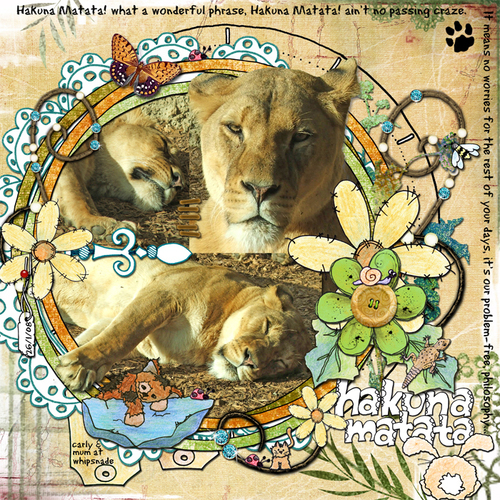 Journaling on this layout speaks for itself I think - the only thing you don't see is me panicking when Carly rang me from the lion enclosure - all excited - to tell me that this lioness was attempting to gain access to the car in front!! She got some fabulous photo's though LOL (look at her teeth around the door handle!). 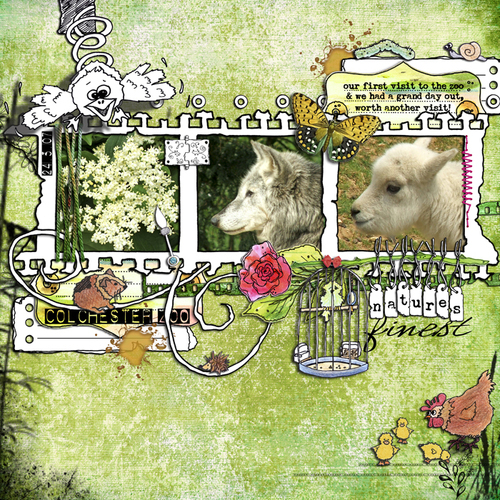 Created using my kits: 'Oh Boy', Green for 'Go alpha', 'Hearts and Flowers', 'New Beginnings', 'Pets' and stitching is taken from 'Tiny Tags' kit. 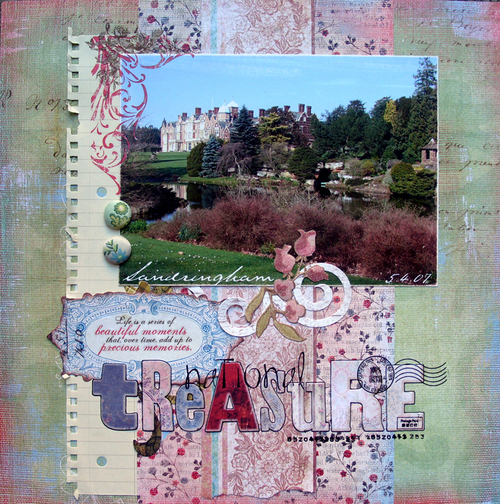 Another paper layout LOL - Sandringham House - the grounds were amazing, especially the view across the lake - a little boat house in a cave and follies. Doesn't seem almost a year ago we were there. 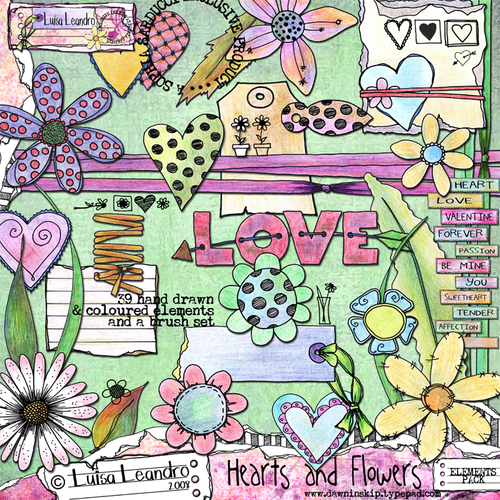 Here's the first products to hit the shelves - all unique hand-drawn and coloured elements ... perfect for not only Valentines Day, but for any tome of the year - Hearts and Flowers kits are available as an Elements Kit, Paper Kit or a complete bundle - giving you a further saving. 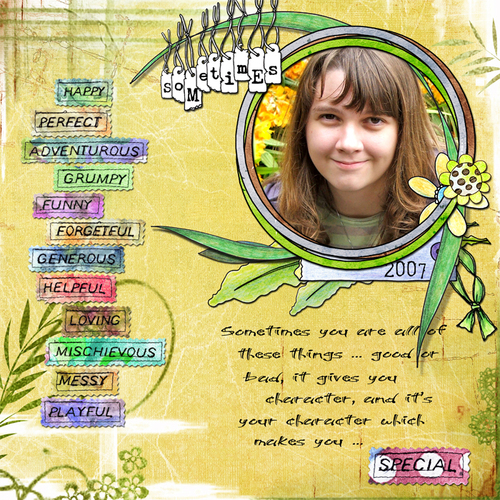 Elements kit contains 30 hand-drawn and coloured elements and a hand-drawn brush set. 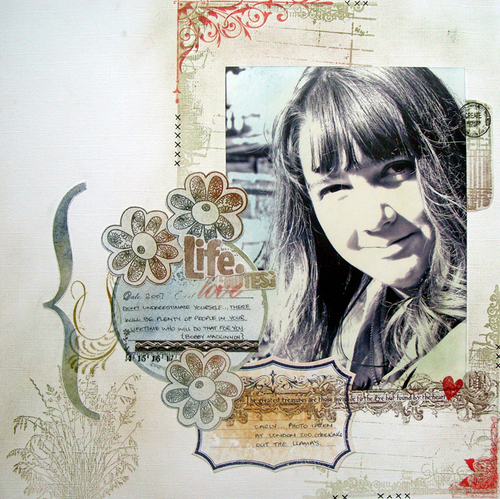 Paper pack contains 6 delicious papers, some a little grungy, some with a little added texture and/or pattern and some a little of both. 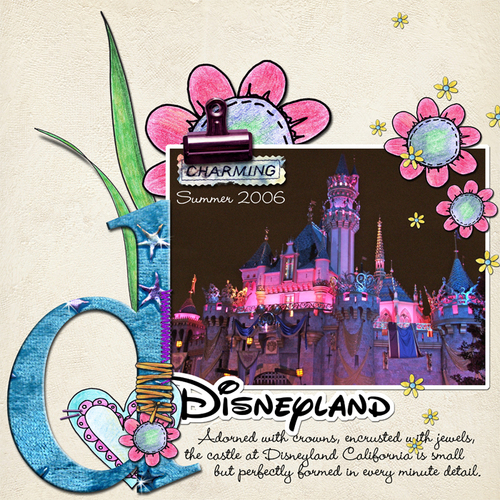 Everything has been prepared at 300dpi for optimum print quality. 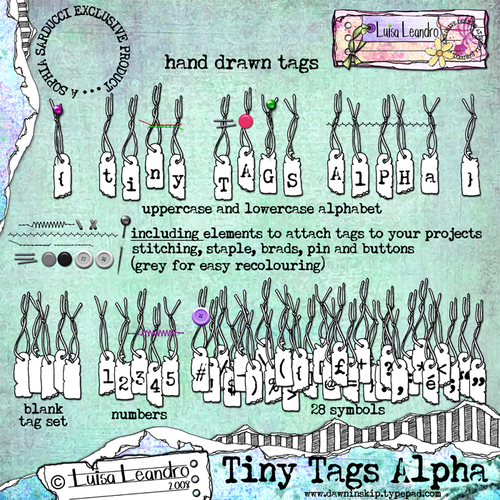 Tiny Tags is one of those little alpha's you can turn to againa and again... the little black number of the aloha digi world :) Here's what you get: both uppercase and lowercase alphabet set, numbers, a shed-load of symbols - 28 in all … a set of 5 blank tags for you to personalise. And that's not all ... 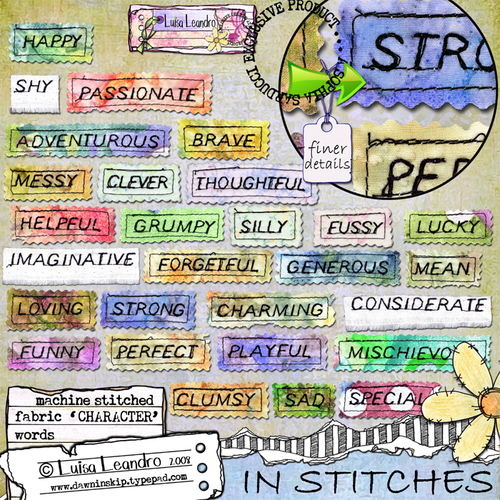 I've included a collection of elements to attach the tags to your projects, I've kept these grey for easy-colouring - elements include: 5 different hand and machine stitches, staple, brads, dress-making pin and 2 buttons (one with stitches and one without). 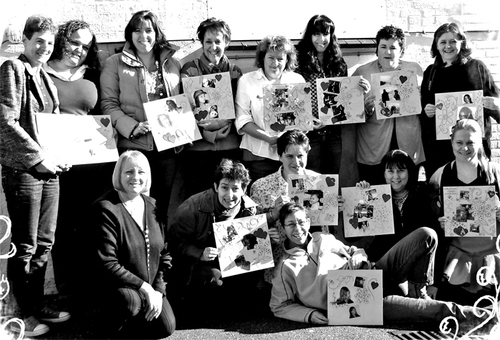 All .PNG files prepared at 300dpi for optimum print quality. No drop shadows - only on preview for effect. 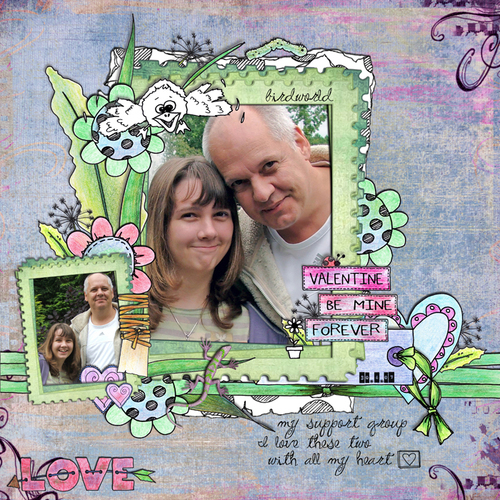 The Boss and her Daddy :) Layout created using 'Hearts and Flowers' (Luisa Leandro at Sophia Sarducci), Pets, Lizards and Luisa's Debut !!! Cute little kitty cats - except the babies aren't quite so little now! Basking in the sun and in full view for a change LOL. 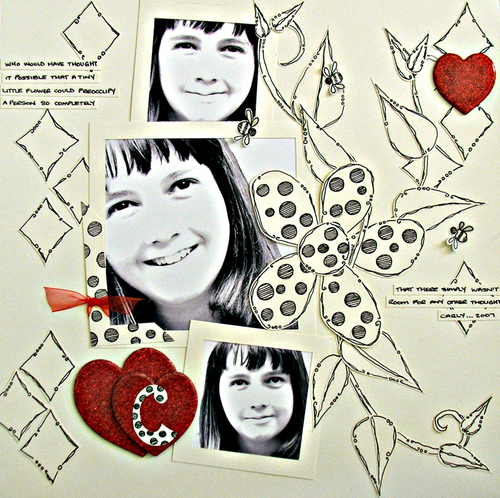 Kits used: Pets, Timeless Treasures, New Beginnings, Cartoon Capers - all by Dawn Inskip and Tiny Tags and Hearts and Flowers (at Sophia Sarducci). 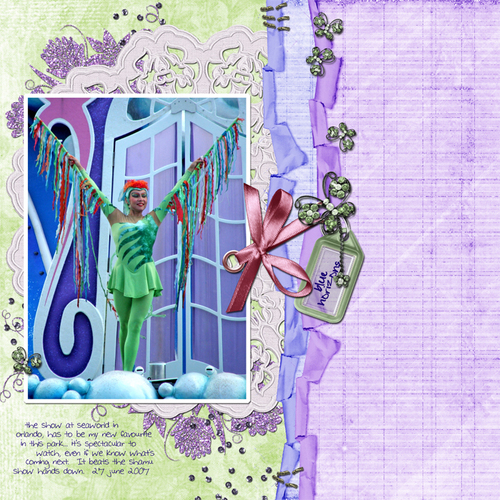 Had alot of fun creating this pageand love tomix and match elements from different kits. Had a fantastic day at the crop yesterday - only managed 3 layouts, but loads of chat and eating :) Need to photograph the layouts - will add those at next update. 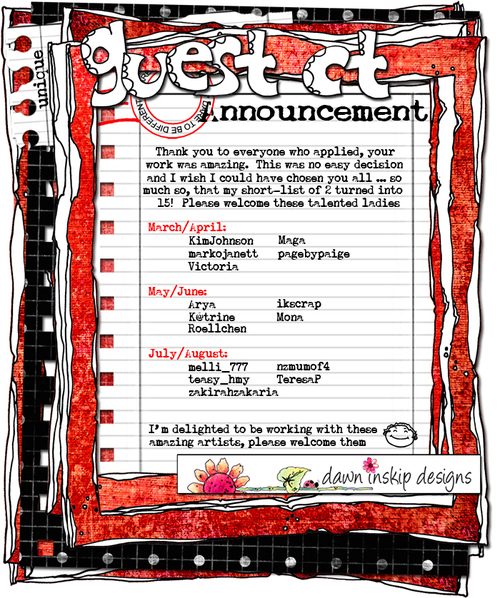 Ladies ... your work is amazing - the very best of luck working with the special kit :) I am so sorry I couldn't pick you all - but there's always a 'next time' :) Thank you to everybody who applied.